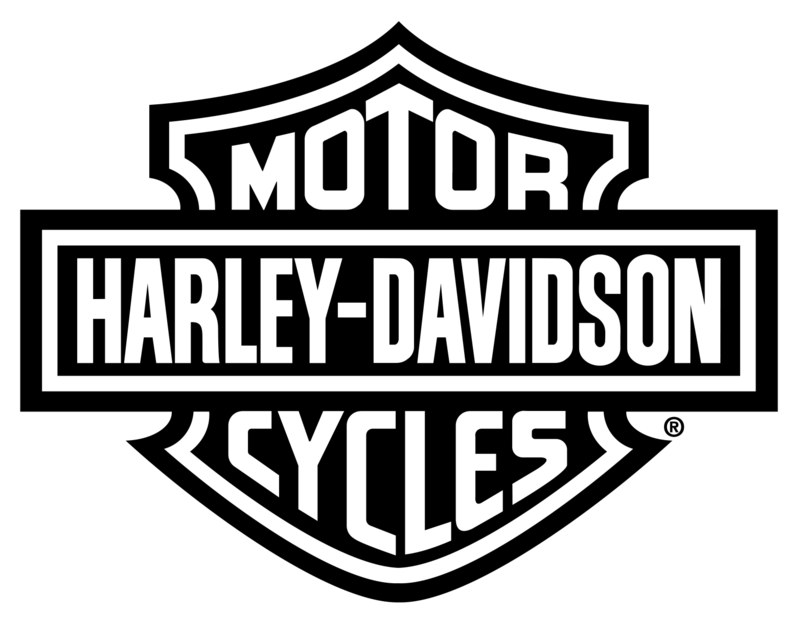 It just seems like yesterday I was at the 100th Anniversary Harley Davidson wingding in Milwaukee and now five years have past. I rode with a group of seven Harleys from Central Indiana. We got lodging in Janesville, WI, and motored back and forth for the various activities. I rode one of my present Harley’s which is a 2003 Road King, (FLHRI). At the time of the 100th Anniversary Celebration I had my bike for one year already. Although it was my third Road King, I was proud of it and thought it was appropriate that I rode an Anniversary model to the centennial H-D Anniversary. As this sport goes, I got rained on before I got out of town! Weeks before heading to Milwaukee for all of this I had already established an agenda in my mind for when I got there. I wanted to see the old H D factories on Juneau Street first. 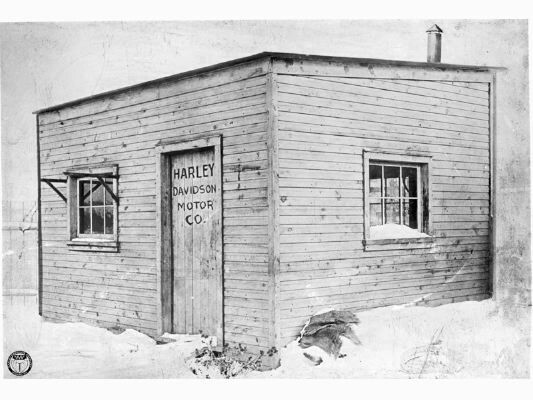 Then I wanted to find out where the original 1903 H-D 10 by 14 foot shed was located, place my Road King in that exact spot, and snap a photo. Legend has it that the father of the three founding Davidson brothers was a carpenter and made this shed for the young enthusiast to tinker in and develop their motorcycle. From what I had read, the Juneau Plant was not too far from where the Davidson family had resided. In fact, I have seen photos of the original shed after it had been moved closer to the factory. However, in a book pertaining to H-D history that was written in 1972 … the original little shed close to the factory was “accidentally” torn down. Very near the old Juneau Factory is a nice reproduction of that original shed. 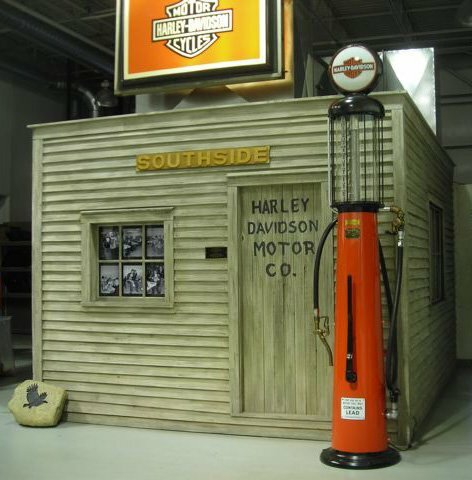 You can also find an excellent full-size replica of the old Shed in the service department of Indianapolis Southside Harley-Davidson. It houses their dyno tuner. I broke off from the group I was with and went directly to the old factory. After I got to the factory, I asked some of the folks working in and around the factory just exactly where the original shed was? Four different people gave me four different answers. Hence, I figured I better research this and find it out for myself. I got out my Milwaukee map and made my way downtown to the city’s main public library. Upon arriving at the library, I noticed a nice collection of old Harley Davidson photos of the factories and motorcycles. In addition, many books on Harley Davidson were on a special display intended to harmonize with the 100th anniversary festivities. After glancing over this display, I retired to the library reference department. I wanted to study old federal census records, old city directories, and Sanborn Fire Insurance maps. I told the librarian about my agenda for finding the original location of the old shed, and they pointed me to all the resource material available, invited me to help myself, and if I needed any further assistance, to let them know (they were very professional). From doing research in a different city in the past, I figured I could come up with the answer I desired. Some of the details from the neighborhood history where the Davidson family had lived indicated that it had been developed a total of three times... twice as a residential area and most recently as commercial properties. 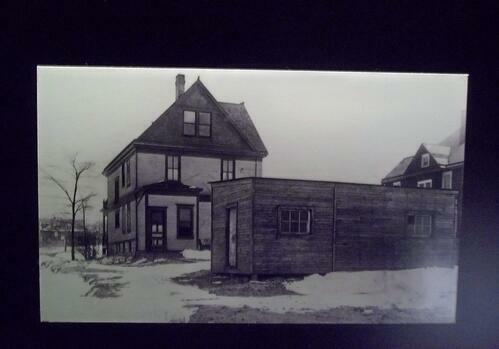 I was able to determine that the Davidson home was on the corner of 37th and Highland. There had been two homes built on this lot in the past. One of the houses had faced 37th, and one of the houses had faced Highland, but nonetheless two different homes. Now all of this research took several hours even though I had done this sort of thing before. I did not want to leave any rock unturned. As I departed, the librarians advised me that I had taught them something about Harley Davidson history because they hadn’t a clue where the original shed had been. They thanked me for patronizing their library. The staff at that library are indeed an asset to the Milwaukee City Library System. OK, finally I could return from whence I came to see what was on the corner of 37th and Highland, then place my Road King in the spot where the shed had been in 1903, and snap my photo. From my current map it was obvious that the streets in that portion of the city were laid out the same as they had been for over 100 years. So that was a good thing. 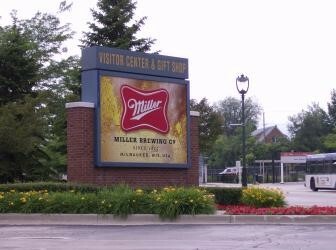 When I arrived at the corner of 37th and Highland where the Davidson’s had lived, I found that the lot their home formerly sat on is now the location of … THE MILLER BREWERY PARKING LOT! The parking lot takes up nearly a half a city block or more. 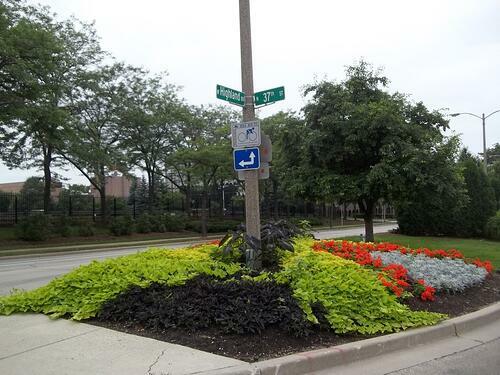 It has a contemporary wrought iron fence around it, adorned with landscaping, and of course, completely covered with black asphalt. I could have ridden my bike into the Miller parking lot and taken the photo that I wanted, but I decided not to. Night had fallen, and I didn’t think the photo would turn out too well. Still this was the highlight of my trip in 2003. A trip to Milwaukee is a great experience. There is a treasure trove of motorcycle history in that city, and I’m going back someday! 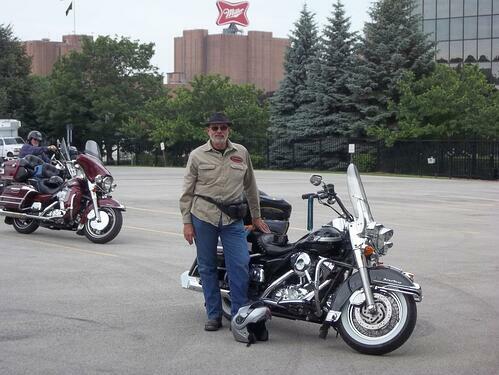 In June of 2011 three pals of mine and myself rode our Harley’s to Milwaukee. Our agenda was to visit the official Harley-Davidson Museum. 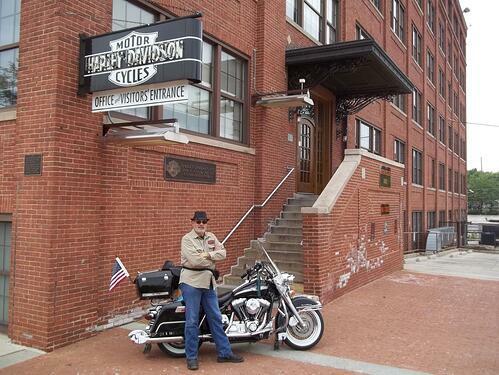 Also see the old factory and I wanted to show my pals where the original 1903 Harley-Davidson shop was. A friend of mine who lives in the Milwaukee area also joined us on his Road Glide. Here are a few images of this return trip to Milwaukee. I am featuring the site of where the original H-D shop was. This is the back yard of the Davidson home at 37th St. and Highland Blvd. This image is in the Harley-Davidson Museum proper. We made our way to the intersection of 37th and Highland. Presently the whole city block is the parking lot for the miller brewery. We went on Saturday so the lot was empty and that made it easy for taking photos. Also we rode by and took some photos of the old HD factory on Juneau. Present Corner of 37th Street and Highland Blvd. Milwaukee WI. 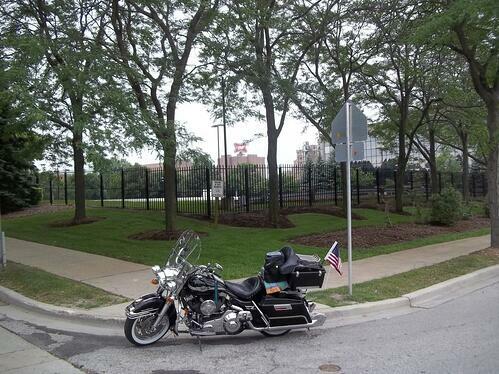 The original 1903 H-D Shed was located just inside that fenced area inside the Miller Brewery Parking Lot. My Road King and I located exactly where the original 1903 H-D Shed was located. At the old Harley-Davidson Factory entrance on Juneau Ave.